Businesses that use an exceptionally high volume of water and want to set up shop in the City of Chandler will have to prove they bring significant benefits to the city, or pay more for their water. The ordinance, passed by Chandler's council in May, is another step toward smart economic growth. Considering water supply when developing land seems as if it should come naturally. It doesn't. The recent Moving Forward report on municipal and industrial water conservation in the Colorado River Basin points out that local planning departments in the seven basin states often don't coordinate with water departments and utilities. The report recommends cities increase the integration of land use with water supplies. The background: Arizona became a leader in municipal water management 35 years ago when it passed the 1980 Groundwater Management Act. The law pushed cities to shift from pumping non-renewable groundwater to using mostly river water, called renewable surface water. The majority of the Greater Phoenix Metropolitan Area’s water supplies now come from the Colorado, Salt and Verde rivers and from reclaimed water, which is treated and recycled wastewater. AMWUA member cities store some surface water and reclaimed water underground for use when needed. The Act also requires developers in the state’s most populous areas to show a 100-year water supply is in hand before they may sell subdivision lots. The challenge: Chandler has secured enough water to ensure it meets and surpasses the 100-year supply the state requires as the city develops the final 15 percent of the land within its boundaries. The city has accomplished this through water contracts, storing water underground, and building infrastructure to widely distribute reclaimed water. Now Chandler wants to get the most value from its water supply as it develops the city’s remaining land and grows its community and businesses. 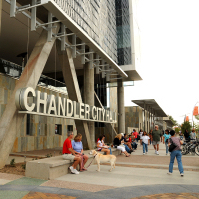 The solution: Chandler’s new ordinance helps the city make decisions about land use and water use simultaneously. The new ordinance allots water to new businesses based on the square-footage and the type of their building or buildings. If a business needs more water than the base allocation, the business must demonstrate it benefits the city commensurate to the extra water it requires to operate. Those benefits could include such things as creating jobs, developing the downtown corridor, revitalizing neighborhoods, or providing a new amenity, such as a park. New businesses (or expanding businesses that require new water meters) that cannot demonstrate benefits that balance an outsized demand for water will pay more for water. Here are a couple examples of how the new ordinance works. A new business with a five-story building might use 200,000 gallons of water a day and provide 500 jobs to the city. That’s 400 gallons per day per employee. Under the new ordinance, the city would provide water to the business at the normal water rate because its jobs benefit the city and its residents. A new business with a five-story building might use 100,000 gallons a day, but provide only 100 jobs to the city. That’s 1,000 gallons per day per employee, not enough of a contribution to the city to balance the business’s water consumption. Under the new ordinance and to make sure other water customers are not subsidizing the business, Chandler could ask this business to pay more for its water. The ordinance does not have a jobs-per-gallons-of-water formula that a business must meet. It is flexible depending on where a business is built and what benefits it offers the city and its residents. Once again, an AMWUA member city steps out to lead. The new ordinance demonstrates that AMWUA cities not only understand how to stay one step ahead of their water supplies, but have the will to act on that knowledge.